Dec 6, 2017 – Note recent article links added below. With the Dec. 18 deadline for commercial vehicles to be equipped with an electronic logging device, or ELD, fast approaching, concerns have risen in the equestrian community about how the mandate will affect them. An ELD is a device on a vehicle that connects to the engine and automatically monitors the time an engine is running and the mileage it’s driven. The mandate is part of the 2012 Moving Ahead For Progress In The 21st Century bill or MAP-21, which required the Federal Motor Carrier Safety Administration to mandate the use of ELDs on commercial vehicles. In December of 2015, the final rule was published, and a two-year awareness and transition phase began, where drivers were encouraged to make the transition from paper logbooks and other logging software to the ELD. The rule impacts drivers who are already required to keep a log of their driving hours. The intent of the device is that when a commercial vehicle is stopped, there is an accurate record of how long the driver has been on the road. As it stands, drivers have a 14-hour work period, while only 11 of those hours can be spent actually driving. Once that time has expired, drivers have a mandatory 10-hour break before they can resume driving. The biggest problem in the horse industry arises when there is a delay in loading the truck. In this scenario, though the driver is not actively working, his time clock is still running and his window to get the horses dropped off—and his rig back to the yard—has decreased. One solution would be to add a second driver, however with increased personnel comes increased cost. The American Horse Council has requested a year delay for the equine industry to come into compliance and is simultaneously advocating for specific exemptions for the horse industry. One of these exemptions would be a split sleeping berth exemption. The DOT has verbally agreed to a 90-day extension for the agricultural industry, however that extension has not been officially passed. The ELD mandate has also raised concerns about whether people outside of commercial hauling companies will be impacted. Truck-and-trailer combinations with a gross vehicle weight over 26,000 pounds are required to have a driver with a commercial driver’s license; a CDL is also required if the the purpose of the vehicle is deemed commercial. The American Horse Council suggests reaching out to the FMCSA or the DOT, to ensure that you’re in compliance. Click to view the AHC Electronic Logging Device Mandate ‘How Will It Affect You?’ brochure. 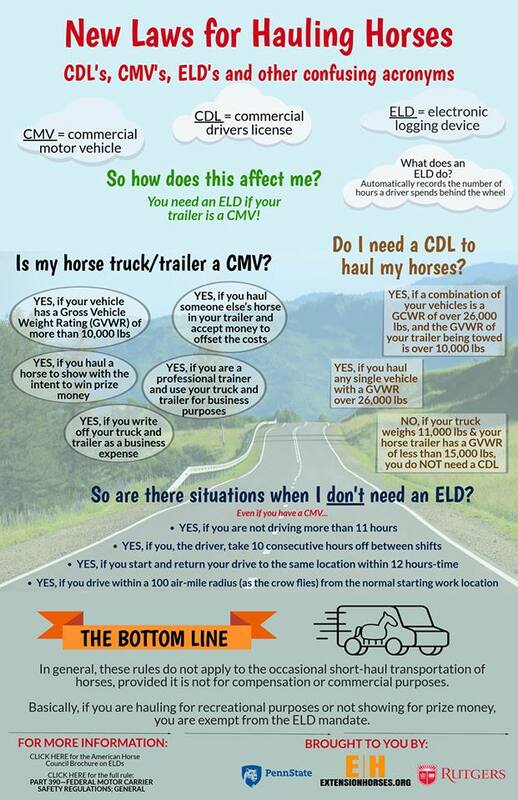 Click to read how the ELD mandate will impact the horse industry. Did you know that the AHC – American Horse Council works to protect equestrian issues in Washington D.C.? Check out their website and article addressing this issue. Consider showing your support by joining AHC today. Click to read the ECFR mandate.